Pine Bluffs newly appointed Town Sheriff Ruff Justice, in an interview with the Gazette’s transport correspondent Gus Breyhound, outlined how he will be cracking down on the behaviour of young drivers in the vicinity of Al’s Diner. These ‘Rowdies’, as described by the Sherriff, have been participating in the new anti-social pastime of drag racing which disturbs the peace of the neighbourhood and causes Al’s dog to bark all night. 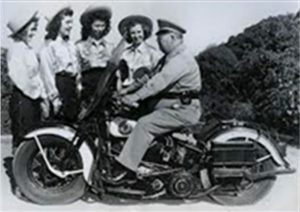 Until recently the Sherriff and his Deputies have not been able to apprehend the culprits as their police cruisers have not been fast enough. However, the Sherriff explained, this will change with the arrival of a new high powered police motor cycle, that will reach speeds as high as 50 miles per hour. He sends this message to the drag racers, “Beware, I will be waiting”.